It’s where you spend most of your time. If you’re like many people and you feel like you’re in a rush during the mornings, there’s a good chance that you eat two out of three meals there. You decorate your desk to help it feel like home and most of your friends come from this place. The importance of a good work place has never been more obvious. But there’s so much more to a good work place than that. If you’re going to spend most of your adult life in the work force, you’ve got to make it count outside of the career and company. You’ve got to take the time to improve things like your waste management efforts in the office. If you’re lucky, you’re already in a place that has put a true value to the idea, “think green”. In fact, some states have put laws in place that encourage businesses to go green. They go out of their way to reward employees who drive sustainable vehicles or use public transit. But if your office isn’t there yet, it’s up to you to spark that fire and spread the think green mindset. Welcome to square one. It’s time to dig deep and begin to think of ways that you can help improve the waste management efforts for everyone at work. It all starts with an idea. Perhaps you’ve already searched, “Where can I find a recycling center near me?” on your phone. You’ve got the blue bin, the compost bin and even a separate receptacle for your glass bottles. Take that waste management motivation and bring it into the office with you. Sit down with your boss, even just for a minute, and let them know statistics about the money that can be saved when you’ve got a great recycling program. Numbers will help drive their interest, and give your go green effort more validity. If you can tell that your boss is onboard with the idea of recycling, it’s time to suggest the pros. Many companies actually have a program where they send a waste management professional into your office to do an audit. 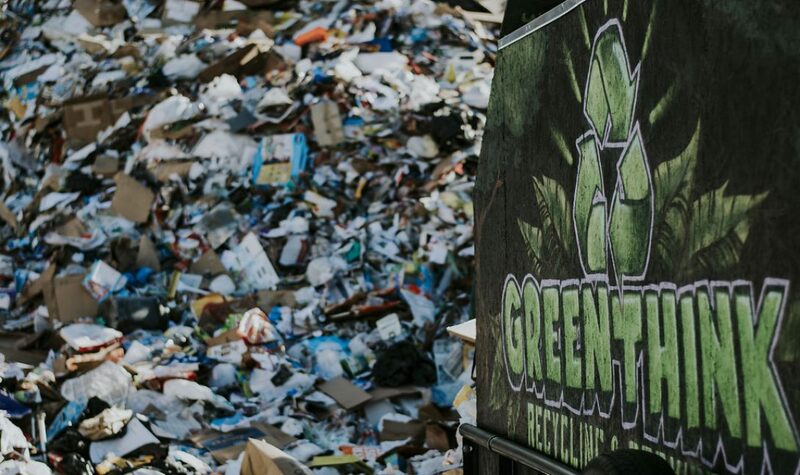 They take a look at weak spots in your current program and give you an estimate of how much extra money you could have in your budget if you only put in that recycling effort. It won’t take long before your boss understands that recycling is less expensive than disposal services. Less trash means less upkeep on the disposal side, which means less money for them. Now that you’ve got him onboard, you can suggest the idea that some is in charge of the recycling program. These waste management programs, no matter how strong they are, take constant education and effort. The businesses that find success in this area typically hire someone or promote someone within whose extra task is to keep the education effort going. Whether it’s a monthly meeting or a yearly effort, this person needs to keep the excitement going through creative and innovative suggestions. Not to mention, taking ownership of this kind of initiative will look great on your resume if you ever decide to make a change in your career path. It’s a pretty straightforward idea that a great recycling program’s success depends on the participation, continued education and coordination in the office. This is where you, the new recycling coordinator, come in. Your first task can seem a little out there, but it’s time to take a look into trash bins to get an idea of how much paper and plastic are simply being thrown out. Give people an idea of how many unnecessary items are coming out of your workspace. This can mean taking the recyclables out of the trash and putting them into one large bag. During your first education session, you can give a great visual for the people who are a little more skeptical. Be sure to start small with your waste management program. It’s easy to get overwhelmed and kill the idea entirely before it’s even in motion. As you simply explain the efforts that will be made around the office, try to make recycling fun. You can start with creative posters that can be put up around major waste spaces in the office. These can be jokes that get hung around the copy machine or a how to poster that goes near the garbage can. When your team is a little more motivated to go green, it’s time to bring out the big guns. Everyone likes a friendly competition, and this one is going to take a little more coordination on your part. Divide the office into teams and see who can reduce their waste the most. This means that they need individual cans for each area. Come together at the end of the week and compare the amount of recycling they each gathered. Try to talk your boss into a big reward, whether that means that the winning team gets to go out to lunch or they get some extra paid time off. Always keep in mind that recycling efforts can’t be a one-time thing. You’ll need to host many meetings to keep people aware and thinking green. Figure out how often you can or you need to get everyone together. If you’re struggling to keep everyone exciting, be sure to remind them that reducing waste will create a more efficient office for everyone. A major area that many workplaces have comes from their consumption. This can happen in the kitchen when the person in charge of stocking dishes and cookware decides that plastic is preferable. It’s a common mistake that people make. You don’t want to deal with dirty dishes that nobody wants to wash. Why not go disposable? This can also happen in places like by the printer. The wrong sheet of paper gets printed 273 times, so somebody tosses them to hide there embarrassment, without considering what it might mean for the waste management system. It’s up to you to purchase with waste prevention in mind. You may not be in charge of what gets brought into the office, but you can coordinate with the person who does handle that task. Find a way to make reusable dishes work. Take the extra time to figure out the major waste spots in the office. For most places, this is unsurprisingly by the printer. Establish a system that encourages double sided printing and reducing recycling waste. Depending on how creative you are, try to reuse items in your office in unique ways. If someone is getting rid of cardboard boxes, show how they can be used as storage. Take that two liter bottle, cut it in half and turn it into a vase for some bright flowers. By putting these items on display, the importance of recycling is never too far away. If you get the green light, take it a step further and develop a compost plan. Countless office spaces see a large amount of waste coming from lunch or catered meals that could instead help the environment. Whatever you choose to do with your waste management efforts, always do your best to keep it from sounding condescending. You want everyone to feel like they’re a major part of this important go green plan. The importance of removal comes in different ways. You’ve already learned the importance of removing unhealthy consumption habits that have been commonplace up to this point in time. I mean, who really considered the effects of wasting too much paper. But at this point, what more can you do? This one is going to cause a little more disruption, so you’ve got to be ready for pushback. You’ll need all the support you can get. It’s time to remove individual garbage cans from the office space. If someone has to choose between throwing away recyclables in their own bin or instead getting up and putting them in the proper blue bin, there’s a good chance that they won’t want to disrupt their work flow for a recycling effort. It isn’t a malicious thing, rather an efficiency thing. Make it so they need to get up and sort it into the correct bin. As an added bonus, we all know that sitting is the new smoking, so the extra exercise when moving back and forth to the trash cans will be a great thing. Then comes the second form of removal—removal of recycling from the office. If you find yourself working in a large complex with many other offices in the space, you’ve got a golden opportunity. Coordinate your reduce, reuse and recycle efforts with these other people. If you take the time to team up, you’ll actually find that your waste management program is more cost effective than you could have pictured. Combine your programs for one single cost and split it between the two of you. You’ll both be saving money, so it’s a win-win. People like to work with companies who share their values or have high standards and morals. When it comes to saving the planet, this idea has never been more important than it is to the millennial generation. Do your best to keep your waste management program fun so that recycling doesn’t feel like a chore. You’ll have something to be proud of when you realize just how much good you’re doing for the world and for your space. Go green for the greater good. Previous Post Zero Waste Bloggers: the Future of Waste Management?